Hardy perennial plants, native to Europe, Asia Minor, China and Japan, members of the family Paeoniaceae. There are three basic types of Peony, the herbaceous types (which die back to the ground in the winter), the tree peonies (which retain their woody growth in shrub form), and the Itoh (Intersectional) types (which have features of both other groups). Blooms are classified as Single, Semi-double, Japanese, Anemone, Double, and Bomb-Double. 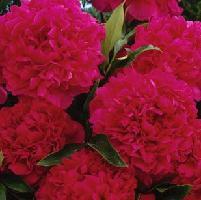 There are literally hundreds of varieties of peonies available for gardeners. 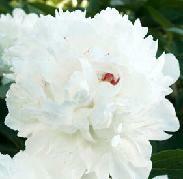 Herbaceous peonies can thrive in a sunny or partially sunny location and prefer deep rich soil. Heavy clay soils are not well suited and cause stunted growth, lack of blooms and short lives. 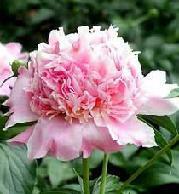 Any site chosen for peonies should be dug deeply (12-20 inches) and enriched with well rotted manure or compost. If the soil is sandy, some heavier soil should be worked in. The base of the plants should be mulched with decayed manure in the springs to help retain water in the soil, which is essential for them to reach their full potential. The rhizomes should be planted in a location where they can remain undisturbed for several years, as the plants take tie to become fully established. Many growers say that it is best to plant peonies in a south facing location, and to avoid eastern spots that can get hot sun after a chilly night with a light frost (this causes the flower buds to sunburn and the blooms to become damaged). Avoid spots that are near the roots of established trees, which will steal nutrients from them. They should be allowed plenty of room to grow, as they tend to occupy a great deal of space and remain growing long after the blooms have disappeared. They are often used as a low hedge or border, where they can grow undisturbed. Larger blooms can be obtained by disbudding (removing all buds from each stem except the terminal ones). Buds should be pcked or pinched out as early as possible, care being taken not to damage the terminal bud. Peonies are very hardy and withstand cold temperatures quite well. After frost has killed back the foliage, it should be cut off just below ground level, but not deep enough to injury the buds or the crown of the rhizome. Winter mulch is uneccesary, as it limits the air flow and can damage the roots. 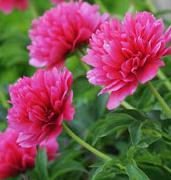 Peonies should be planted in early fall or in early spring when the soil can be worked deeply. Rhizomes should be set so that the crowns are covered with about 2 inches of soil and should be spaced about 3 feet apart each way. new shrubs. 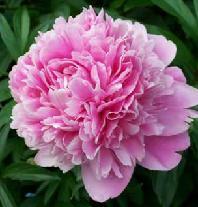 Peonies may also be propagated by seed. Please note, however , that patience is required as it takes about 5 to 7 years for these plants to bloom. Also, any seed planted will not necessarily run true to the parent plant, and may have a completely different appearance. Paeonia suffuticosa is a deciduous shrub about 3 to 5 feet in height and possessing large blooms in May and June. 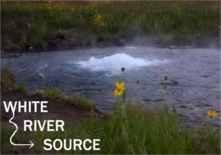 They come in a wide variety of colors and forms. 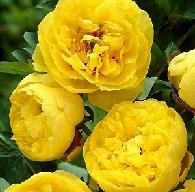 The plant thrives in ordinary well drained garden soil. Heavy clay soil should be lightened by adding compost and a scattering of sand. Sandy soils should be enhanced with compost, leaf mold, or peat. The plants are hardy and can take light frosts on new growth, but heavy frosts may do a slight bit of damage to new groth in the spring. Like the herbaceous varieties, it is best to plant in a location that does not recieve the full force of the morning sun, so that, in case the plant does get hit with a heavy frost that freezes the new growth, it will have a chance to thaw slowly, which will mean less damage to the plant. 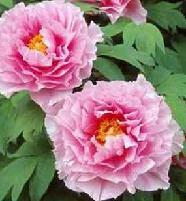 Alex Fleming - Paeonia lactiflora - Gorgeous soft pink double blooms and deep green foliage. 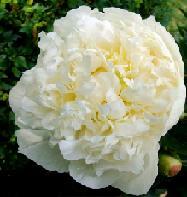 Duchesse de Nemours - Paeonia lactiflora - The most famous of the white peonies, this lovely shrub has huge fully double snow white blooms. 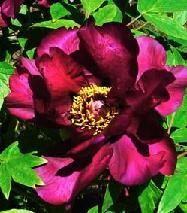 Felix Crousse - Paeonia lactiflora - Brilliant deep red blooms with some silvering are produced freely in clusters. Makes a truly spectacular display. Festiva Maxima - Paeonia lactiflora - Pure white blooms with flecks of red. 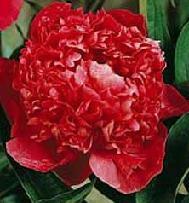 Karl Rosenfield - Paeonia lactiflora - Old standard for red peonies. Deep cranberry red double blooms make a truly stunning display. Perfect for borders or low hedges. Sarah Bernhardt - Paeonia lactiflora - Like their namesake, these delicate pink double blooms are true beauties. Use as a border, hedge or as a mass planting for astounding color. Rosa Plena - Paeonia lactiflora - Huge double red blooms on dwarf compact plants. Makes an excellent low border or mass planting. We ship tree peonies as #1 roots. These are large roots which should bloom in 1 to 2 years. High Noon - Amazingly beautiful tree peony with huge bright yellow blooms with a red flame in the center that can reach 7-1/2 inches in diameter. Fragrant addition to the garden. Yachiyotsubaki - Pink semi-double to double ruffled blooms on sturdy plants.